Yarn bombing. It's not just about knit and run anymore. Over the past few years, yarn bombing - the art of covering public spaces with yarn and fabric of any kind -- has become less of a vandal's delight and more of a community experience. As seen in Santa Monica, California, recently when dozens of fabric artists came together to "bomb" the 18th Street Arts Center. Co-organized by Arzu Arda Kosar and Heather Hoggan, the group aims to bring people together in peace, love and creativity. The event included yarn art by over 65 artists, including screenwriter Guinevere Turner, a.k.a. "Captain Hook" in the yarn bombing community. Turnstyle News sat down with Arzu Arda Kosar to hear about how she took the concept of the knitting circle to a whole new stratosphere. Turnstyle News: How did you come up with the idea for this yarn bombing event? Arzu Arda Kosar: It started out as something we envisioned, as being really small, and it really grew much larger. From the very get-go, our interest was inviting artists and non-artists, alike. Trying to make this open to more people who might be involved in knitting and streets art or any form of creative concern. We hoped we could put a lot of people together to see what we would get, to mesh high arts and low arts. We have over 65 artists participating. Turnstyle News: What kind of artists will you be showcasing? Arzu Arda Kosar: I couldn't be any more impressed with the crowd that has responded. We have people who are career artists and people who are accountants. For example, there is an older lady who was knitting because that was her way of relaxing, but then her problem was she didn't have any purpose for all this production. She was making all these cozies and things that nobody wanted. But then when she saw this event on Facebook, of all places, she said, "I now know what to do with my knitting." I think her goal was to make 100 hummingbirds. Turnstyle News: Yarn bombers usually knit and run, but here you're displaying the art alongside the artists. Was this on purpose? Arzu Arda Kosar: We really wanted people to come and hang out together. We were hoping for some sort of synergy that would help people get to know each other or help them learn new techniques or find like-minded others that they could connect and network with. We also hoped people would bounce around ideas and create new projects. In fact, it has already happened. Several of us participated in an empathy circle for the Japanese disaster. We made a 12-foot knit red circle. We wanted to so something for the community. Turnstyle News: What feedback have you gotten from those involved? Arzu Arda Kosar: A lot of the people have told me that they are so happy to be involved because they have so much creativity that they didn't know what to do with and now they can focus it on something. Some of them also felt like that all work that they'd been doing all these years, that was almost unwanted production, became meaningful and wanted. They felt a sense of accomplishment. Turnstyle News: What do you think about yarn bombing as a form of vandalism? Arzu Arda Kosar: Yarn bombing can be considered a form of vandalism as in the case that you're not really asking for permission. People who are involved in yarn bombing, who aren't participating in a festival atmosphere like this, a lot of times, their motivation is they want to add color to an environment. Or, especially in Europe, yarn bombers are interested in making some kind of political statement. For example, if they add a soft cozie to a rifle of a statue that's in the park. But again, that is their idea of making that environment better. It may not be somebody else's idea of making that environment better. But ultimately, the idea of doing this through knitting, or crocheting or yarn, is the idea that you can remove it without actually damaging the original structure that you're attaching it to, unlike paint. You can easily remove these items with scissors. And half the time, it will degrade anyways, because yarn isn't meant to be out on the street forever. Turnstyle News: What attracted you to this form of art? Arzu Arda Kosar: It's very very different than the street art we're used to, which is typically young, male, underground, dangerous, back streets of New York type of thing... Street art doesn't necessarily have to be like that. I actually came upon street art when I was working with a group of youths. I was trying to identify youth groups by following their street art, geographically and psychologically. I wanted to communicate with them. It was difficult. I couldn't just go up to them as this 40-year-old woman and start talking. So, I started trying to get them to react to me by putting up stickers and different forms of street art. They noticed and started to ask, "Who is this new person putting up street art?" "Does she have street cred?" "Is she for real?" I was doing stickers at the time, not yarn. But it was my way of trying to get through to a group of people who I would otherwise not be able to create a dialog with. It was a two-year project. I realized that I don't have to look tough and dangerous. I don't have to adhere to a male sensibility when creating my art. 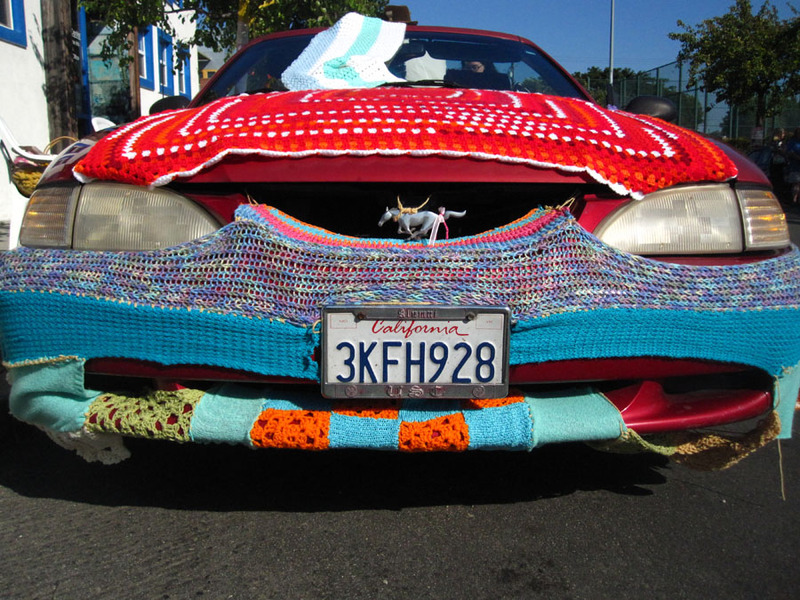 Turnstyle News: Do you think it's important for more people to experiment with yarn bombing? Arzu Arda Kosar: I'm very much pro public art. I'm very much pro supporting anyone who something to say or who wants to put out creative art into the environment. You don't have to be a professional artist. You don't have to have gone to art school. But if you have done all of those things, like if you're a gallery artist and you've done that, that's fine, too. I'm very much interested in seeing the lines between high arts and low arts blur. This is one great opportunity for this to happen and for it to happen in public realm.